CINCINNATI -- Sixty years after Frank Robinson broke in with the Reds – perfectly spanning the old-and-the-new eras at Crosley Field and becoming a torchbearer for the color barrier broken by Jackie Robinson – the beginning of the first on-site commemoration of Crosley Field was unveiled under overcast skies. The timing of Monday's ceremony was fortuitous, given the two-day release of Ken Burns' new documentary on Jackie Robinson to be aired Monday and Tuesday nights on PBS. Jackie made his Crosley Field debut on May 13, 1947. Oh, for a season as glorious as the one that debuted a decade later with rookie Frank Robinson. That season, the one that began in 1956 at Crosley Field at Findlay and Western on the West End, will be evoked by the new mural at the Crosley Field Historic Site. A rendering of the Crosley Field mural. The Reds opened that season 1-and-5 – the inverse record of the Reds' present-day start – and then won 10 of their next 11 games. The entire rest of the season, the Reds were in a three-team pennant race that congested West End streets with cars and foot traffic. The Reds drew a million fans for the first time in their history and began seriously thinking about building a new ballpark elsewhere in the city. The team did move to Riverfront Stadium in 1970. Today, the space that was once Crosley Field is now home of the City Gospel Mission. And on Monday, the mission began a project that will keep the history of the field alive and proudly on display. 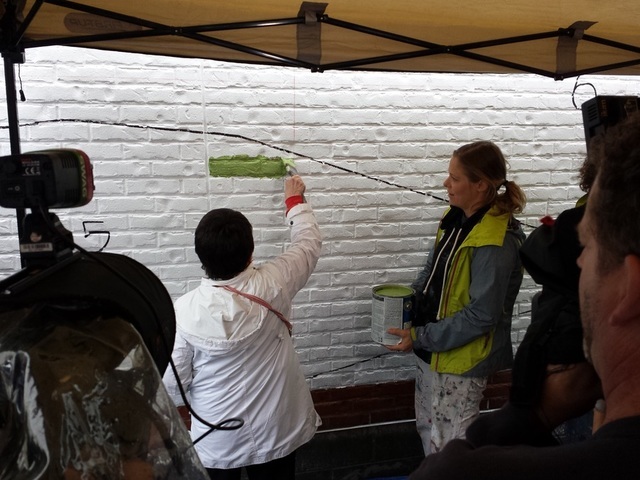 Former Red Tommy Helms led a group of volunteers Monday morning in painting the first stroke of a 16-by-48-foot mural on a wall at City Gospel Mission, 1805 Dalton St.
Monday was the 104th anniversary of the first game played at Crosley Field, which was then called "Redland Field." As noted by Tim Curtis, the communications director at City Gospel Mission, the mural depicts mid-1950s' era Crosley Field, which was the glory era there. Former Sports Illustrated writer and “The Babe” author Robert Creamer described Crosley Field as “the most intimate ballpark in baseball” – and that includes Fenway Park and Wrigley Field. Eleanor Kluszewski, widow of the great and popular Reds slugger Ted Kluszeswki, provided me with my favorite description of what it was like to sit in the grandstand and look out to the outfield walls and the buildings beyond. “It was hard to tell where the ballpark ended and the city began," she said. The mural is part of the Crosley Field Historic Site, a partnership between City Gospel Mission and the Reds Hall of Fame and Museum. The historic site will be dedicated June 6 and is free to visit. Years ago, I co-authored a book on the old ball yard with Reds historian Greg Rhodes titled “Crosley Field: The Illustrated History of a Classic Ballpark." So, I have more than a passing interest in the progress of the Crosley Field Historic Site. From what I saw Monday, the movers-and-shakers are off to a wonderful start. But hey, not everybody can have the vision and historical preservation sense of the city of Pittsburgh and the Pirates: The Forbes Field left-center and center-field brick walls, with "457 FT" and "436 FT" painted on them, still stand, along with the stadium's flagpole. But to paraphrase the old saying, the best time to plant a tree was 60 years ago, and the second best time is today. 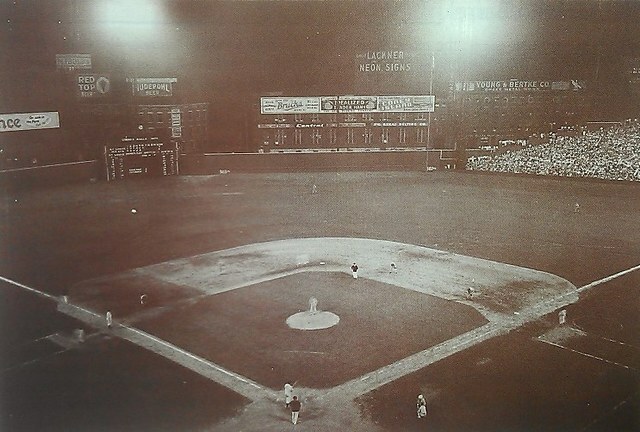 The reason I wrote at the top of this story that Frank Robinson's rookie season in 1956 spanned “the old and the new eras” at Crosley Field, is that then-new scoreboard – five stories high – went up in time for the 1957 season. When I was working on the Crosley Field book, Frank Robinson told me that he often found himself missing the old 20-foot-high scoreboard of his rookie season, when he plastered 38 home runs as part of the 221 that the Reds hit that season to tie the then-major league record. Yes, there is something about Crosley Field's hold on us that is worth commemorating. Since coming on board at City Gospel Mission last August, Tim Curtis has marveled at what seems to be at least every other week, random groups of people drop by the Mission grounds to try to imagine and resurrect old Crosley Field in their mind's eye. Old ballparks are like that. Don't believe it? Just cue up the song “There Used To Be a Ballpark,” on YouTube. Frank Sinatra could be singing about Crosley Field. From the hot-dogs and the beer. Yes, there used to be a ballpark right here. And the new team hardly tries. Yes, there used to be a ballpark right here."